i rarely punctuate my year with retail. i mean, my week, sure. having worked at nordstrom for several years (clothing design, kidswear) anniversary was a special ‘season’ that we designed into. before working there, i didn’t know what it was. or what it meant to the inhabitants of the seattle area (i rarely wait outside a store at 5am, i was shocked to see HORDES in JULY). it’s part of the job for corporate employees to work today (and into the weekend if you’re really going for the gold star) in the stores. helping the sales team, restocking, ringing… ensuring the event is the best that it can be, and that each customer (think so many people you can’t walk a straight line anywhere) gets the customer service nordstrom is renowned for. i hope it goes well, anniversary for nordstrom can rival holiday. i looked at the book i received, and although i won’t be doing any shopping myself, i liked seeing that high end retail is paying attention. lots of accessories, smart price points… happy anniversary. sale. want to see some other great sales going on this weekend in the area? then click here ! This is my favorite view of the NOrdstrom downtown. I took a similar shot in sepia… and it looks very special. 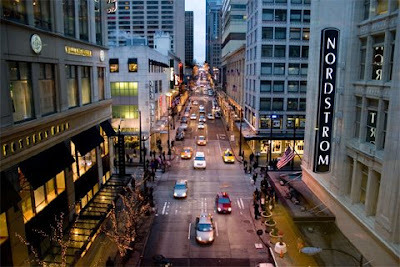 Nordstrom is a big part of the Seattle fashion scene. I'm going to their Fall 2009 designer preview this WEdnesday. It should be good.